This is the first episode of Spider-Man in which none of the regular supporting cast, including Peter Parker, appears. Spins a web, any size: Spider-Man uses his web to a: a bat puppet b: two parachutes, which double as sand scoops; a hung glider; a web heart for the Invisible Girl. Peter Parker has thrown away his specs, punched Flash Thompson, and resolved to be more like Spider-Man in his dealings with the world from now on. He’s had a mighty pleasant day having a fight with the scientific marvel of the age. So he thinks to himself: “What shall I do next? I know! I shall round the day off by picking a fight with the most famous celebrity on the planet.” He is so far gone that he not only spars with Torch (who is a near contemporary and who he knows a bit): he also tries to web Mr Fantastic’s arms and pick a fight with the Thing. If you’ve ever wondered what would happen if Stan Lee were allowed to "dream up" a Spider-Man story on his own, without Steve Ditko to flesh it out for him...well, wonder no longer. Here it is. Kirby penciled this story, presumably in his sleep. Ditko is credited as inker. No Peter Parker. No supporting cast. No plot or set up of any kind. A nine page fight scene, without motivation or resolution. Spider-Man turns up at the Torch’s posh house and plays a stupid prank. Reed Richards turns up and tells them to stop. That’s literally it. One can't know, of course. But I can imagine Stan going to Jack and saying “Hey, Jack, what if Spider-Man and the Human Torch had a fight? Maybe Spider-Man gate-crashes one of Johnny's parties?” and Jack giving him precisely that: a nine page fight scene. Whereas if Stan had gone to Steve and said “Hey, Steve, what if Spider-Man had a fight with Doctor Doom? Maybe Doctor Doom kidnaps one of his school mates?” Steve would have produced a complicated and funny back story to set up the fight. Spider-Man with Peter Parker doesn't work. 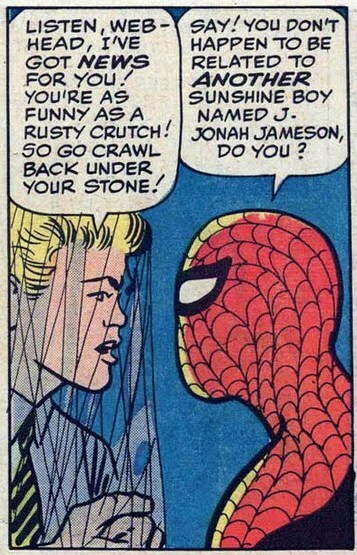 Peter Parker is a wimp, a cry-baby and sometimes a jerk. Spider-Man is an arrogant braggart. And sometimes a jerk. But somewhere in the space between the two of them is a reasonable human being: a hero. Spider-Man’s bravado is bearable because it is offset by thought-balloons in Parker’s voice; Parker’s whining is bearable because the Gemini-mask reminds us that he is also Spider-Man. Take Parker away, and Spider-Man just comes across as an idiot. There is none of the wit and humour that he showed when fighting for his life against the Vulture. It’s just two alleged heroes sneering at each other. — Okay you animated insect! You asked for it! Here I come! — Mercy me! I’d better prepared a little welcome for such a big, bad, blazing bird-brain. It is just the sort of thing Flash Thompson might have said. Perhaps, like Peter’s bout with Flash, this needs to be looked at in terms of masculine ego; of two guys around 16 or 17 sorting out where they are in the pecking order. 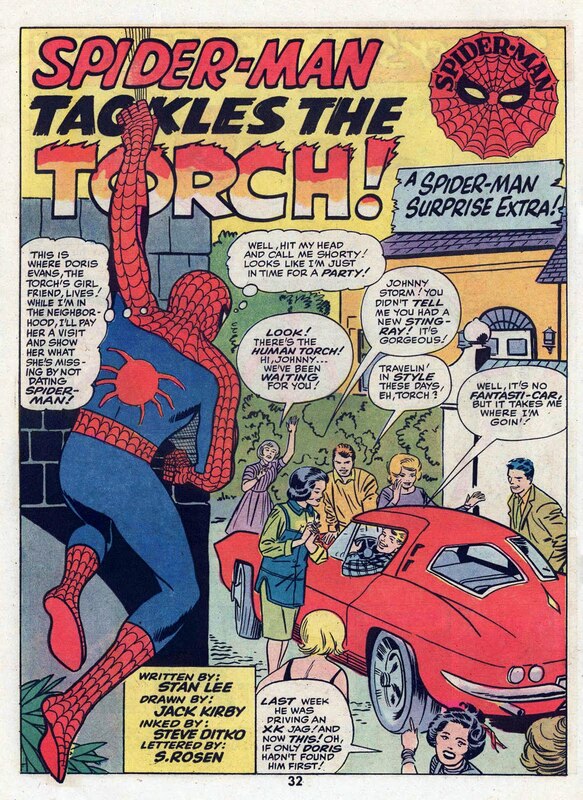 Spider-Man deliberately acts like a jerk to give the Torch an excuse to hit him, which gives him an excuse to hit him back. They are so near to being equals in the superhero world, they can’t be friends until they’ve had a fight. We don’t doubt that if a bad guy showed up they’d fight him alongside each other. Johnny and Ben scrap all the time, but Stan Lee assures us that they’d risk their lives for each other without question. Mr Fantastic intervenes before the fight is over, so neither Johnny nor Spider-Man are top dog. The feud continues. The fight itself is tolerably watchable, but it relies too heavily on gimmicks. 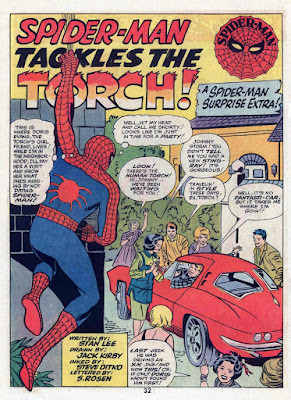 The Torch creates objects with his flames, and Spider-Man creates objects out of web to counter them. It’s a lazy way of writing; too much like one of those Green Lantern stories when the goodie calls up a giant green rolled up newspaper to thwack the baddie, and the baddie calls up a giant green umbrella to shield himself. This is not Spider-Man. This is not a tale of sheer fantasy so real you’ll feel it’s happening to you. This is Spider-Man the corporate symbol, wrenched from his context and forced to appear as guest star in a story where he doesn’t belong. One story like this doesn’t do much harm. Next month, the real Peter Parker will be back, fretting about Aunt May’s medical bills. But in a few years this kind of thing will become so prevalent that we'll barely be able to remember when Peter Parker was a character as opposed to a guest-star opportunity. This project is supported by my 40 generous Patreon fans. Why not become number 41? So does this demonstrate why we should be glad Kirby didn't do Spider-Man, because it would have just been fight scenes (which Lee liked) without the subtly of Parker? I think that's a really good question. I think the problem with "what ifs" is that you are always imagining Ditko's Spider-Man, but drawn by Kirby. I think that Thor and the Fantastic Four were the intersection of Lee and Kirby's brains, and Spider-Man was the intersection of Lee and Ditko's. 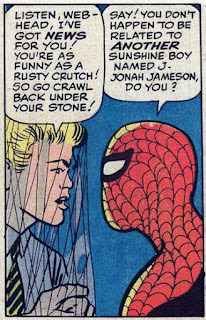 If Kirby had taken Lee's wall crawling teenager and run with it, doubtless there would have been no Jameson and no Betty Brant and maybe no Doc Ock. But there might have been weird science and cosmic stuff. (Or maybe it would have been the perfect reboot of Newsboy Legion, in the way that the F.F was the perfect reboot of Challengers of the Unknown.) It might still have been brilliant, but it would have been a different thing. No-one but Ditko could possibly have done Doctor Strange, though.